Someone asked me to look at their hive. I have only been taking care of bees for a year but I have seen what happens when hives are not well tended. This one has not been opened in maybe a year. What do you think I will find and what do I do if they have built out comb on the lid and outside of the frames? I would simply look at the frames to see if the queen is laying and that there is good brood, and cut out any queen cells (swarm cells). You could then add a queen excluder and honey super to give them a little more room and they may just make some honey. Here it is customary to keep bees in two deep boxes. What is in the two deeps is for the bees. when they are built up strong, a queen excluder and super are added. What they put in the super is for the beekeeper. The queen excluder is so that the queen will not lay eggs in the honey super. We've had some frost, it's crunch time and not much flowers left... but I think this is a honeybee? I dumped it out here. I guess she was able to recover and fly off, none-the-worse for the caffein kick because I didn't see her later. Applestar, yes that looks like a honey bee. Its been clear and cool here. It has got up into the upper 50s so the bees can come out for a cleansing flight. No flowers in bloom. Many years we have snow by this date, but not any storms this season. Forecast is for another 5 days of sunshine. We just treated the hives with MAQ's. There are a few frames of honey, but it may not be enough to be worth harvesting yet. The small queen in one of the hives is able to get through the excluder and she likes to brood in the supers. She is a good layer, and she has a strong hive, but it does make it hard to harvest honey. A couple of hives were split and requeened a couple of months ago and are rebuilding. We replaced some of the old frames with new ones, but the bees seem reluctant to build on them. They would rather build their own comb on the inner cover. It is warm enough here and we have a diverse planting so their is forage for them all year. The bees like to forage on the basil in the herb garden and can be seen buzzing about most of the day. "We replaced some of the old frames with new ones, but the bees seem reluctant to build on them. " I went to using split bottom frames and then putting in full sheets of reinforced foundation. When the bees are crowded and needing room, you can add a super with these frames in it and the bees usually go right on it and draw it out, almost every cell worker size. Just a few drone cells around the edge. I like these reinforced frames as they hold up well in the extractor and don't sag when used as brood combs. Pic of the new frame with wired foundation. The Spinner This one holds 18 frames and has an electric motor drive. I like to use the medium sized frames for honey collection. I can at least lift a box without breaking my back. The full sized frames in a box and all full of honey get to be a challenge to lift a box. Here we are in January and minus 13 degrees here this morning. Won't be much bee activity going on. I just wonder if they can even survive this cold? I guess we will see in April? We use foundation frames, the bees just seem to prefer drawing their own comb instead of building on the foundation. It takes them awhile to work on them. We have already had to remove some comb that they built on the inner cover and at a 45 degree angle to the frame. They accept the older frames but we want to replace them since they are over 4 years old. On the last inspection we found 3 bees with deformed wings. We just completed MAQ treatment so we are hoping these are older bees. Tho old 4 frame hand crank spinner. "We have already had to remove some comb that they built on the inner cover and at a 45 degree angle to the frame." Inner cover? Why do you use inner covers? What is the purpose of the inner cover? The only use I ever had for an inner cover is if I was going to put a bee escape in the hole and then use it to remove the bees from the supers. If you are using Langstroth type bee boxes and frames, there should be about a 3/8 inch space between the top of the frame and the lid of the box. Now if you put an innercover on then there is another space that the inner cover adds and that added to the 3/8 space you already had gives close to 3/4 inch space between the frames and the lid. Yes the bees will build in that 3/4 inch space. To avoid this, just set the innercover aside and use the lid only. Has anyone ever seen this? I saw it on tv some time ago and thought it was interesting. 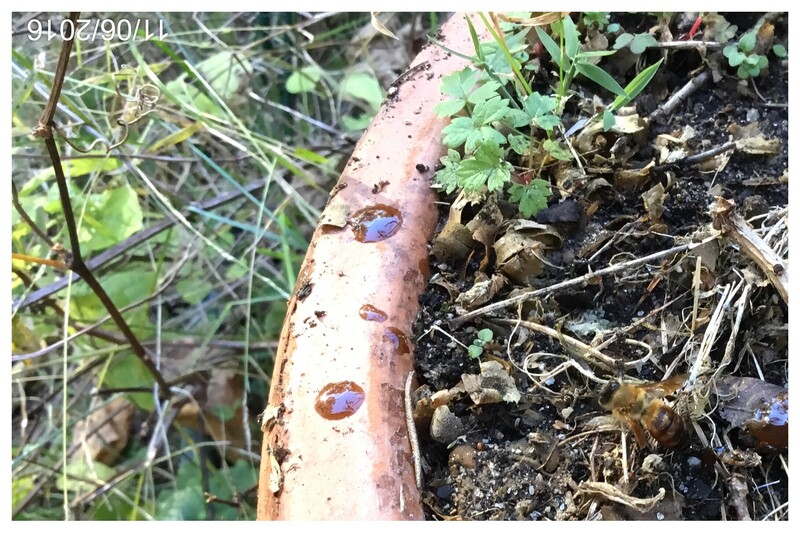 I don't know much about bees, so I don't quite understand how it might be different from a regular hive. I'm mostly just curious.